‘Dost thou in hounds aspire to deathless fame? Learn well their lineage and their ancient stem. As you know, we have just had Crufts here in the UK and, as I predicted, the anti-pedigree lobby were out in force spreading their untruths and sometimes downright lies to an ever-ignorant but always very receptive media. Among the litany of incorrect statements produced, one in particular really stuck in my mind. Really? 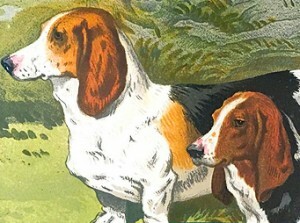 As anyone who has followed this series of historical articles on our beloved pedigree breeds will know, in the vast majority of cases this is blatantly untrue and the person who wrote the pithy remark quite clearly didn’t have the breed under consideration this month, the Basset Hound, in mind. Man has always had a fascination for them. Posted by Alex on May 12 2018. Filed under Current Articles, Featured. You can follow any responses to this entry through the RSS 2.0. Both comments and pings are currently closed.